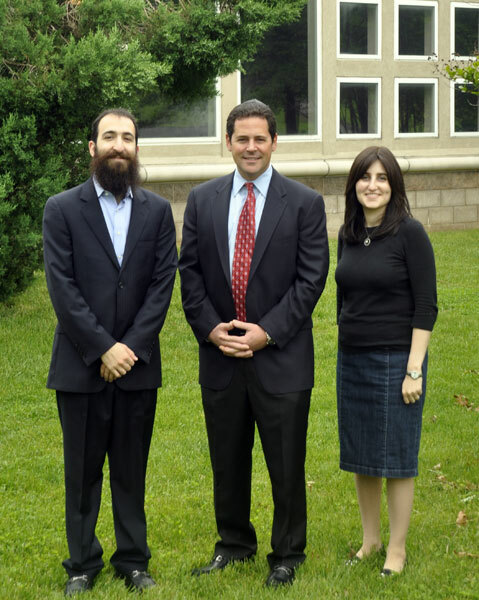 Rabbi Yossi and Dina Kanelsky flank Marlboro Mayor Jonathan Hornik May 22 in front of the Center for Jewish Life. Nearly 400 people attended a Lag Ba’Omer party and Open House on May 22 at the newly opened Center for Jewish Life, located on Route 79 in Marlboro. Many came for the camaraderie of the festive holiday; others came seeking tours of the newly relocated Orthodox synagogue that, according to its religious leader, Rabbi Yossi Kanelsky, welcomes all Jews regardless of background. Marlboro Mayor Jonathan Hornik was on hand to tour the facility and congratulate the teens who helped organized the event. Formerly the leader of Bris Avrohom of Old Bridge, which has closed, Kanelsky opened the new center in Marlboro last month. The location, the former Monmouth Worship Center, offers 17 classrooms and a sanctuary and social hall that can accommodate more than 500 people. The facility is 18,000 square feet, which is 18 times larger than the Old Bridge facility, Kanelsky said. The sanctuary is designed with separate seating for men and women. “We serve people from Middlesex, Monmouth, and Ocean counties, so we are now in the heart of the community that we serve. This was a match made in heaven,” said Kanelsky, 27, who moved to Marlboro with his wife, Dina, and their three children, ages six, five, and two. Dina Kanelsky serves as director of the center’s religious school, which offers after-school and Sunday programs for youths ages five-18. Kanelsky formerly served as outreach director of Bris Avrohom, an organization headed by his father, Rabbi Mordechai Kanelsky, that provides religious, social, and outreach services to immigrants from the former Soviet Union. Founded in 1979, Bris Avrohom is affiliated with Chabad-Lubavitch. It now has locations in Hillside, Fair Lawn, Jersey City, and Brooklyn. In setting up his new synagogue, Kanelsky faced a challenge from Rabbi Boruch Chazanow, who heads the Chabad-Lubavitch of Western Monmouth County in Manalapan, and Rabbi Moshe Herson, head shaliah, or emissary, for Chabad-Lubavitch in New Jersey. Under an agreement with the Central Committee of Chabad-Lubavitch Rabbis in the United States and Canada, the new center will not be associated with Chabad-Lubavitch or its affiliates, such as Bris Avrohom. Bris Avrohom in Old Bridge started in 2004 in a meeting room at an apartment complex, mostly serving FSU immigrants, said Kanelsky, who learned Russian from his immigrant parents. The synagogue grew quickly, moving into the larger building in Old Bridge, which is now closed. “It has been a lifelong dream of mine to build a new congregation from scratch from the bottom up, and this dream is coming to fruition,” Kanelsky said. “While we were once in a small apartment complex meeting room, we are now in reach of houses of all levels and sizes. “There are hundreds of families that consider me their spiritual leader, and who have followed me to the center,” said Kanelsky. In addition, hundreds of Jews, many of them unaffiliated, live within walking distance of the new location, Kanelsky said. “This will open up a door to them by providing a welcoming home to Jews from all backgrounds and ages. Why shouldn’t kids who go to public school have the opportunity to bond with other Jewish children? “Since we opened the center, about a dozen new families have joined,” he said. Part of his welcoming philosophy is the lack of mandatory membership fees, the rabbi said. Instead, the synagogue has voluntary partnership programs where families donate on a monthly or annual basis. That philosophy is one of the center’s many draws, Jenny Nagel of Marlboro, a member of Bris Avrohom since 1994, told NJJN in a phone conversation. Nagel moved to the United States from Ukraine 20 years ago, eventually settling in New Jersey, where she and her family decided to try a High Holy Day service in a local shul. For Tanya Smertenko of Manalapan, the Kanelskys’ energy and enthusiasm helped spark her passion for Judaism, she said. “Rabbi and Dina know that it’s not about money; it’s about keeping the community together.” Smertenko chairs the center’s JTeen program, a weekly after-school program for teens. For more information about the Center for Jewish Life in Marlboro, call 732-316-7600.